I can usually handle the baby section in stores. I can celebrate baby boys. I even held a baby girl yesterday. But sisters together send me over the edge. That and E's current baby obsession. "[E] is too cute! And she is so gentle with H. I love the way she looks at her. And I don't want to make you sad but I always think that is how she must have looked at baby V. She is such a good big sister even though she can't smile at her little sister in person. I never want to bring these things up with you because I'm just not sure how much you want to talk about V when you are trying to focus on E (and just getting through the day... and remembering to breathe). I honestly cannot imagine how you must feel. I had trouble conceiving and it used to break my heart when I would hear about friends getting pregnant or new babies being born. And that was just feeling the loss of something, someone I hadn't yet met. Your loss is one million times harder. You are a very strong, brave woman and a wonderful mother to your two precious baby girls." "First of all, I need to thank you for acknowledging the situation. I think often times, friends want to avoid bringing up V in case it will make me sad, which it might, but it makes me even sadder to not have the opportunity to talk about her. I have seen that look of understanding in your eyes as E touches H's tiny hand and I just know you know and you care. So thank you. I will admit that more than anything seeing E interacting with a baby, especially a girl baby around V's age...well, I don't know how to describe it. There is nothing more painful. It is one thing to constantly try to navigate my own grief, but it is a whole separate entity to grieve what E has lost. I also have to consider what she understands now, what she will understand later (when we bring another baby home hopefully and she starts asking why baby V never came home), and how her life will always be colored by that loss. That being said, while I might have to turn away for a moment and breathe, I am desperately fighting the urge to avoid the situation because I love you and I don't want our friendship to be altered because of my ability or lack there of to deal with something you certainly can't help or change or control. Thank you for giving me this chance to be honest and get it all out. I love you." 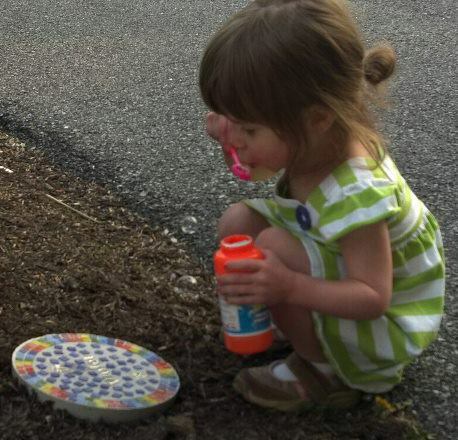 So while they are posting pictures of their beautiful girls, E is blowing bubbles over V's stepping stone and I am desperately trying to let that represent the pictures I can never take of my two together. If you are a mother who lost a child, would you rather someone acknowledge your pain rather than keep it silent? If you are a friend of someone grieving in any way, I think the best thing you can do is say out loud what you are thinking. Most likely, your friend will be glad you've opened the flood gates and given them permission to share with you. Tears streaming down my face as I read this - I feel the same way seeing my daughter with other children, wishing so much that her big brother and little brother could be here with her and that her life was not tainted by their deaths and at such an early age. I much prefer people talk about my sons. They are still my children. People will never "remind" me that they died, it's not something anyone can forget, even for 10 seconds. Compare it to a living child - that parent always has their child on their mind, even while they're working or doing other things without their children. Same goes for those of us who have buried our children. So no one should be afraid of mentioning them. We want the freedom to talk about our children. Tears may fall, but that's ok. I'd rather my children be acknowledged and my daughter's pain also be acknowledged. I want people to acknowledge my Dexter. I'll be honest, there are times .. even within the BLM community, where I feel my son isn't as important as other's babies who have passed. So when someone takes the time to say something about him or talk to me about him.. it's something that lifts my heart up. I am afraid he will fade away & no one will remember him but me & his Daddy. Please don't stop talking to me. I have a baby who is very much alive inside of me and that may not carry over once she is born into this world but she is here now and even after she passes she won't be something we talk about in hushed voices. Her life will be celebrated each and every year, she will always be my daughter and she will always be a baby sister to my two girls. She is a child, not someone who should be forgotten. Dev. Scarlet has a sister too. But no one knows it to look at my family, seeing only one child. My heart breaks with yours. At church and at the park last week, Scarlet ran up to babies in their carrier, bent down and just stood and stared. Both babies were girls. It crushes my soul each time. She will never look at her sister like that. She will never look at her at all. I love u, and E, and V. And my S, and F. Our girls did not deserve to be robbed of that special bond or best friend. I'm struggling along side you. Many many hugs my friend. Reading this made me tear up a bit. You are an amazing writer. Seriously! I love reading your blog. It does really hurt me when people don't talk about by baby. It makes me feel like they don't care like they used to when she first passed away, or that they have forgotten, honestly. Maybe it makes them uncomfortable, or maybe they don't know how to bring it up, or what to say. I would be so happy if one of my friends had a conversation with me about my daughter. Or even mentioned her! It might make me cry a little, but it would also make me so, SO happy. I love talking about her. She's still my baby. I want to acknowledge her. I want to brag about how pretty I think she is. I want people to remember her, to know she existed. It makes my day when someone mentions my son and his name or acknowledges my pain in some way. By someone talking about our babies, they aren't reminding us that they died but by saying their names, they are showing us that they remember and care about them as much as they do my living children. I really appreciate those who even include my son's name on a Christmas card, give him a valentine when my other kids are given one....simply when they include him just like they do my living kids.